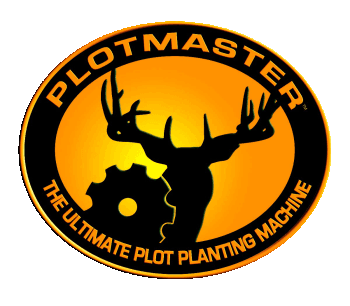 ‘The Ultimate Planting Machine,’ The Plotmaster™, by Plotmaster Systems LLC., with it’s patented design is the complete package for your plot Tillage needs. The Plotmaster™ Hunter 400 Tillage Only (4-ft model) will reach places you’ve only dreamed of planting plots. It’s easy and simple with the Plotmaster™. The Hunter 400 Tillage Only unit comes standard with the rear Chisel Plow Attachment for deeper penetration of hard compacted soils. With the Chisel Plow Attachment being standard with each unit, the Plow Bar has a 2.5" x 2.5" receiver welded to the top side of the plow bar. This additional receiver can be used to mount any standard 2" x 2" spin cast spreader for distribution of fertilizer, lime and even seed! Each unit comes with 16" Pneumatic tires that make the Plotmaster™ easy to transport virtually anywhere and retract electrically, with a push of a button, when you are ready to cultivate. Each unit comes with Flexible metal grating attached to the drag which provides a smooth “infield” finish and helps provide even coverage of soil over your seed for improved production. It can also be used to smooth and prepare your seedbed prior to planting in rough, uneven areas. Both the Hunter 300 & 400 Models are delivered via LTL, (enclosed truck). Residential deliveries will arrive with lift-gate service. The lift-gate will lower the unit to the ground so the customer can gain access. All sales are final and deposits are non-refundable,.